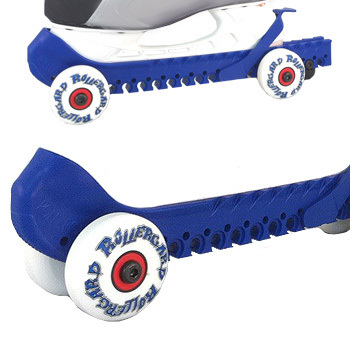 The Rollergard is a new innovative rolling skate guard that allows an ice hockey player or skater the option of roller skating on their ice blades when they are done at the ice arena. Hockey coaches of all age groups now have the option of warming up their players prior to their scheduled ice times. Parents of small kids can now arrive at the rink at their practice time, what a time saver. Improve your skating stride and endurance at the same time. The Rollergard is a great addition to any skater's bag. Skate into the rink, out of the rink, and anywhere that has smooth hard surfaces.